Guy (John Landon) brings his girlfriend, Angelica (Claudia Siefried) to a lovely nightclub called Dracula’s Dungeon. There they are served drinks and entertained by assorted weirdoes. Count Adrain (Des Roberts), the owner, takes a liking to Angelica. He’s also Dracula’s son which makes his plan to show up at her house as a guest and hypnotize her all the easier. Guy enlists the help of Dr. Harris (Robert Branche) to go get her back. They don’t count (See what I did there?) on having to not only face down a vampire and legion of crazies, but also the world’s laziest tiger. What exactly the hell did happen to Dracula? He’s not in this movie and no one ever tells us. Des Robert’s portrayal of Count Adrian is extremely arch, bordering on parody. There are a number of ludicrous moments, like the Count mentioning necrophilia while trying to woo Angelica and then refusing to define the word for her. There’s some wacky Voodoo ritual about eating a lizard, and a long drawn out scene with a tarot card reader that doesn’t make any sense at all. Everything is shot in psychedelic hues and liberal use of a fish-eye lens. 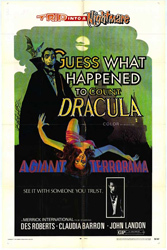 It’s all a colossal mess but a strangely enjoyable one, if you’re in the mood for an undemanding Dracula movie.